Extreme weather events such as life-threatening heat waves and record-breaking downpours are part of the natural climate system, but by definition they are relatively infrequent—even rare. In recent decades, however, some kinds of extreme weather events have become more common. Science has linked some of these general increases to climate change, but it has been difficult until recently to say with confidence whether any single extreme weather event was directly linked to climate change, much less to quantify that relationship. Advances in computer processing power and improved methods for sorting out the many factors that contribute to weather are now allowing scientists not only to determine the extent to which climate change contributed to some extreme weather events but also to say with confidence that certain extreme weather events would not or could not have occurred but for climate change. This is the science of extreme event attribution. Weather is what’s happening in the atmosphere over a short period of time—hours, days, or weeks. Climate is a description of atmospheric behavior over longer periods, typically years, decades, or longer. “Extreme weather” is a relative term meaning especially intense or very severe compared to what normally occurs over a baseline period of time, such as the average for the 20th century. Because there is not a widely accepted technical definition, every analysis must define “extreme”. Is extreme weather really becoming more common? The scientific consensus is “yes,” though details vary from region to region around the globe. Since 1991, the number of U.S. extreme downpours has increased by more than 30 percent compared to the 1901 to 1960 average, contributing to increased flooding. Extreme heat waves and droughts in Europe have more than doubled since 1980. Atlantic hurricane frequency, intensity (Category 4 and 5 storms) and duration have increased substantially since the early 1980s; North Atlantic tropical storm frequency over the years 2000 to 2013 increased by about 50 percent compared to the long-term (1966 to 2009) average. Countless scientific papers, as well as assessments of all those papers by the U.S. National Academies of Sciences, Engineering, and Medicine (NASEM), the U.S. National Climate Assessment, the Intergovernmental Panel on Climate Change (IPCC), and others have concluded that the Earth’s climate system is warming and that most or all of the warming in recent decades has been caused by human activities—primarily the burning of fossil fuels. identify whether certain efforts to address climate change could save more money than they cost. For some kinds of weather events, in some places, there is a clear connection between climate change and weather extremes. When documenting these connections, however, it is important to define terms precisely. For example, an “increase” in a kind of extreme weather can mean “happens more frequently” or “is more extreme when it happens” (in intensity or duration) or both. It’s also important to distinguish between the influence of climate change on certain classes of extreme weather, and climate change’s contribution to a specific extreme weather event. Wildfires are considered “weather-related,” since they are not meteorological events themselves but are linked to weather extremes such as drought and lightning storms. Also not meteorological events per se but among the most certain weather-related impacts of climate change: coastal flooding due to climate-change-linked sea level rise. Extreme heat events will become more frequent, of longer duration, and more severe (including health-threatening higher temperatures at night). Extreme cold events will become less frequent and less severe, but with enough variation to allow for (and in some cases perhaps even contribute to) occasional extreme cold events. Drought events will be more intense in some areas (including, by some models, southern and central Europe and the Mediterranean region, central North America, Central America, Mexico, northeast Brazil, southern Africa) due to lower regional rainfall, decreased snowpack during warm winters, and increased evaporation. Extreme rainfall events will get more intense in some areas (including, by some models, parts of North America and Europe). Tropical cyclones will get more intense as climate warms, but perhaps less frequent. Wildfires will burn more acreage (as climate-related earlier spring lengthens the fire season) and be more severe (in part because of climate-change-induced drought and higher winds) in western United States, Alaska, Canada, Brazil, and east Africa. Is it fair to say climate change has “caused” any specific extreme weather events? Many factors contribute to every weather event; there is no “single cause” for any weather event. Scientists can, however, use climate attribution methods to determine the probability that a past, weather event would have occurred if not for climate change. For example, studies indicate that climate change more than doubled the likelihood of the 2003 European heat wave that contributed to as many as 70,000 deaths. In some instances, climate attribution methods have indicated that the odds of some past extreme events occurring would have been essentially zero if not for the “last straw” of climate change. Climate change can arguably be said to have caused these extreme events, in that it enabled them to reach their ultimate, extreme intensity. What recent extreme weather events can be attributed to climate change? The most prevalent event-attribution technique involves calculating the “fraction of attributable risk” (FAR) for an event—a statistical approach long used by epidemiologists for public health studies. In combination with well-established climate models, FAR allows scientists to assess the probability of an event happening with and without the addition of greenhouse gas emissions related to human activities. Many of these studies have been compiled by the American Meteorological Society in a series of reports called “Explaining Extreme Events of [year] from a Climate Perspective”. To avoid bias, studies are selected for inclusion solely on the basis of how rigorously they are designed. When the studies are completed, the results are published whether they show a connection to climate change or not. Of 131 studies of extreme events compiled in these reports between 2011 and 2016, climate change was determined to play a role in two-thirds of the events but no attributable contribution from climate change was identified in the remaining one-third. Is climate/weather attribution a precise science? Weather is inherently variable, so it takes an enormous amount of data over long periods of time to say with certainty that a specific extreme event was not simply a normal part of this variability. Human activities complicate the process of attributing extreme events to climate change. For example, the frequency and severity of wildfires are affected not just by climate-change-related factors such as earlier spring and drought, but also by land management practices that affect the amount of available fuel. Similarly, extensive surface paving has increased runoff and added to climate-related flooding. More data and improved computer models will increase the certainty with which scientists can determine the connections between extreme weather events and climate change. Attribution of Extreme Weather Events in the Context of Climate Change (2016) is a comprehensive look at the topic from the National Academies of Sciences, Engineering, and Medicine. Explaining Extreme Events of 2016 From A Climate Perspective (2018) is the most recent in a series of annual reports produced as a special supplement to the Bulletin of the American Meteorological Society. Climate Science Special Report (2017) is an authoritative assessment of the science of climate change, with a focus on the United States. Produced by scientists representing federal agencies, national laboratories, universities, and the private sector, with administrative oversight by the U.S. Commerce Department’s National Oceanic and Atmospheric Administration, it represents the first of two volumes of the Fourth National Climate Assessment, mandated by the Global Change Research Act of 1990 and anticipated to be released in full in late 2018. It includes a chapter on Detection and Attribution of Climate Change. The U.S. National Climate Assessment's third and latest report on climate impacts (2014) includes a section on extreme weather events. Managing the Risks of Extreme Events and Disasters to Advance Climate Change Adaptation (2012) is a special report produced by the Intergovernmental Panel on Climate Change, focused on the relationship between climate change and extreme weather, the impacts such events, and strategies to manage associated risks. The science of attributing extreme weather events and its potential contribution to assessing loss and damage associated with climate change impacts, produced by researchers at the Environmental Change Institute at the University of Oxford’s School of Geography and the Environment, is a brief summary of attribution science and its value, including some details about how attribution modeling works. Extreme event attribution: the climate versus weather blame game, 2016, is a useful fact sheet produced by Climate.gov, the climate-change information site of the U.S. Commerce Department’s National Oceanic and Atmospheric Administration (NOAA). The National Center for Atmospheric Research (NCAR) is a federally funded research and development center sponsored by the National Science Foundation. Its website offers numerous evidence-based resources on atmospheric and related sciences, including climate modeling. The World Weather Attribution Initiative is a collaboration with scientific partners from the University of Oxford Environmental Change Institute (ECI), the Royal Netherlands Meteorological Institute (KNMI), the Laboratoire des Sciences du Climate et de l’Environment, NOAA, Princeton University, NCAR, and the Red Cross and Red Crescent Climate Centre. The Initiative is developing tools and methodologies to perform real-time assessments of whether and to what extent human-induced climate change played a role in the magnitude and frequency of extreme weather events. climateprediction.net is a nonprofit, collaborative effort led by climate scientists, computing experts, and others, that performs climate modelling experiments using the home computers of thousands of volunteers to answer questions about how climate change is affecting the world now and may affect the world in the future. 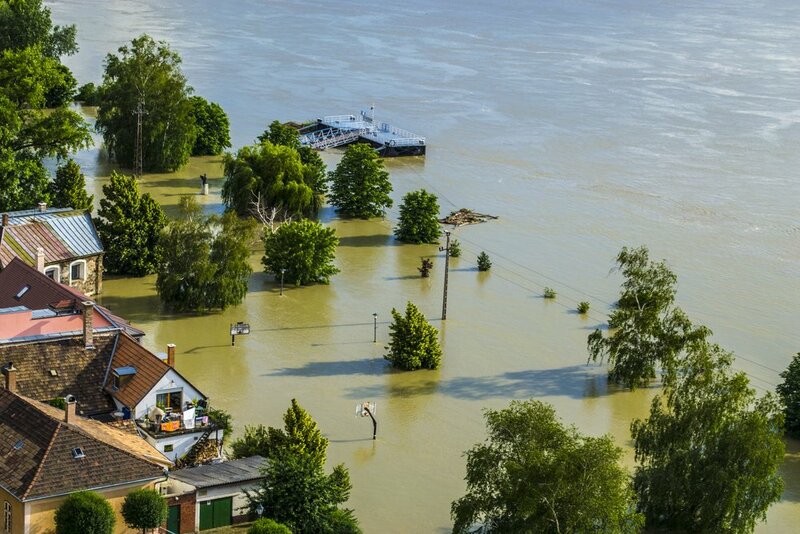 Extreme weather is of deep concern to the insurance industry, which has produced a number of documents describing those concerns and strategies for lowering risk. Among them: Climate Change and Risk Disclosure, by the National Association of Insurance Commissioners, and Climate Change and the Insurance Industry, by the Geneva Association, an insurance industry think tank. Trends in Extreme Weather Events in Europe compiles 20 years of scientific data to summarize recent trends and future likelihoods relating to extreme weather in Europe, including links to climate change.